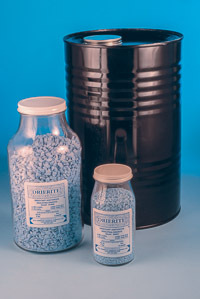 PROPERTIES: Indicating DRIERITE is impregnated with cobalt chloride. 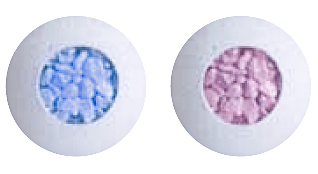 Indicating DRIERITE is blue when dry and changes to pink upon absorption of moisture. The color change is pronounced and clearly visible. This makes Indicating DRIERITE valuable when it is necessary to know with certainty that dryness is being maintained and to signal when the drying agent should be replaced. It has the same efficiency as Regular DRIERITE, and somewhat greater capacity due to the desiccating effect of the cobalt chloride. * It can be regenerated repeatedly for reuse. * It should be noted that Indicating DRIERITE should not be used for the drying of ammonia, NH3, since ammonia reacts with inorganic chlorides.